Ms. Coleman’s 3rd graders enjoyed making their coil pots like the Native American artist Ramona Peters. In fact, many cultures use coils to build with clay in order to make functional artworks like clay pots. 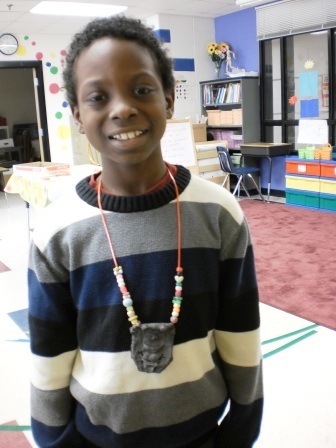 Ms. Coleman’s class used great craftsmanship and worked hard to complete quality work. Thank you to Jarrod Turner from Ms. Billingslea’s 4th grade class. Wendee Vanorder, my art therapist friend, donated a boxful of art supplies and paper to Liberty Point E.S., so thanks, Wendee! Wendee is an Art Therapist. Art can help people express their feelings and thoughts in a special way. 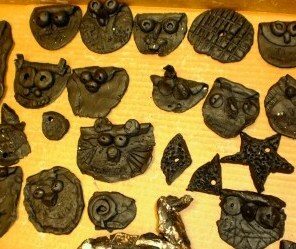 4th graders, the black clay assignment has been fired in the kiln, and it looks fabulous. Truly, black is beautiful! Black Raven clay started out a chocolate brown. After firing at 2,200 degrees, it turned ebony.